Are your workers suffering from workstation related aches and pains? Ask us for a free DSE Assessment! OFI’s expert DSE Assessors are also all qualified Osteopaths or Physiotherapists, so can understand the root cause of pain. Our DSE training courses are designed to safeguard your employee’s health as well as to ensure regulatory compliance. 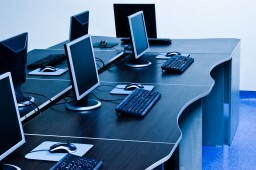 Our courses focus on Display Screen Equipment and Workstation Safety. Injuries caused through the incorrect use of Display Screen Equipment (DSE) are common, but avoidable. To effectively assess Display Screen Equipment, and put solutions in place to reduce injury, expertise is required in both human anatomy and ergonomics. At Osteopaths For Industry we combine our vast knowledge and experience in these sciences to offer DSE Assessment and Training services that are revolutionising the way that organisations protect the health of their employees. Our experts train key members of your team as qualified DSE Assessors, allowing them to carry out Display Screen Equipment Assessments in-house. This provides you with a flexible, cost-effective risk management solution. Our On-Site ‘DSE Risk Assessment’ and ‘DSE Consultancy’ services are carried out at your site by our experienced clinical experts. 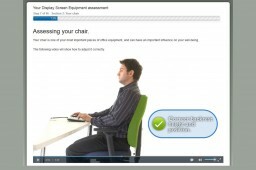 Their detailed understanding of the musculoskeletal interaction with Display Screen Equipment enables us to provide a detailed assessment that can reduce employee injuries.